My friend Naushon taught me this simple and delicious recipe for roasted carrots. 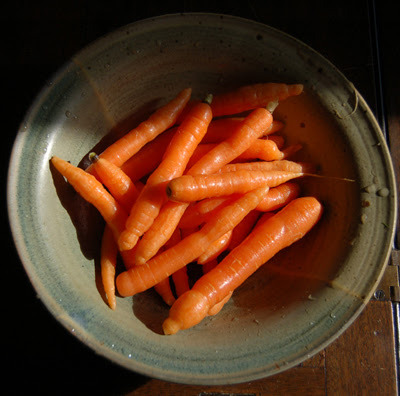 I tried it this spring with the first carrots of the season, fresh from the downtown Berkeley farmer's market. They were small and tender (see photo) so I cooked them mostly whole but it's also delicious with bigger, older carrots - just slice them up. Preheat oven to 450. Clean the carrots and cut off the ends. Cut them into manageable sized pieces, depending on the size of the carrots. Grease a baking dish with either coconut oil, butter or olive oil (I think I actually like the coconut oil best - it lends a subtle sweetness to the end product and is supposedly also really good for you!). Toss the carrots in the dish and add a bit more fat (dot with the butter or coconut oil or throw in a splash of olive oil). Add salt and pepper to taste and drizzle with a bit of honey (you can omit the sweetener if you prefer). Cover with tin foil and bake for 15-20 minutes. Remove the foil and bake another 10 minutes or until nice and tender.